Powdersville is about to show OFF one of the coolest homes! Welcome to 150 Trotter Road! Rolling country hills and mountain views set the stage! 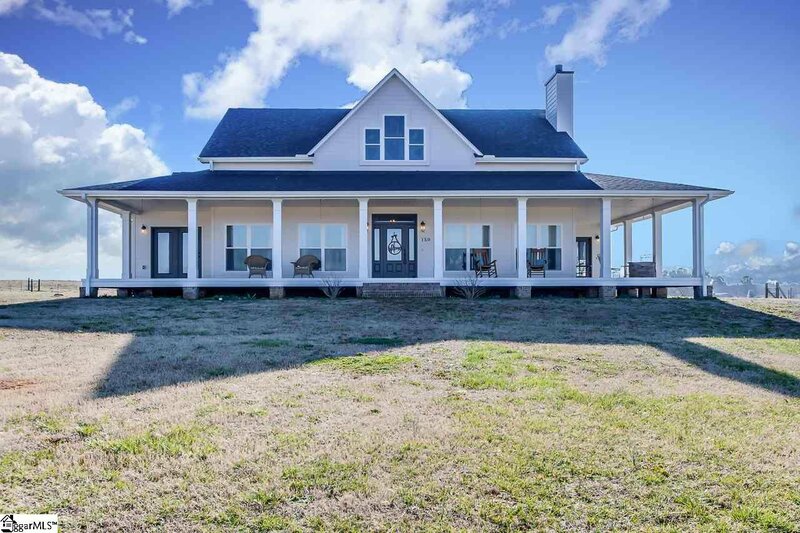 Up the long driveway awaits this Farmhouse that was built in 2017 and nestled perfectly on 5 acres. Come sit on over 1000 square feet of wide front porch with a glass of sweet tea and long conversations to be had. Do you have several rocking chairs? Dreamed of a home that could accommodate? This is it! Let’s go inside. 9 foot Brick columns and tons of detail beg you to enter. Shiplap details the foyer area. Brick fireplace with gas logs dresses the family room. There is plenty of space for oversized couches, chairs, and comfort. Large bright windows frame the room. The kitchen is the heart beat of this home. Take a peek at the well designed cabinets, arabesque tile backspace, upgraded professional appliances, and all the charm you just can’t seem to find these days! The 7 foot work island is sure to be the morning gathering spot! Notice the ship lap detail and the granite is simply lovely! Enjoy doing dishes in the farmhouse sink that also gives view of the back yard from the kitchen. Notice all the wide windows and views from your dining area. Why you could seat a huge host of family and friends with the space provided. Table for 8? You have space! You will LOVE the grilling side porch this home has. As old man winter makes way for spring you have a nice spot to Grill! Also off the kitchen is the laundry room. This space is large enough to actually do chores and provide extra storage. Don’t miss the shiplap details in this room as well. Down the hall you will enjoy the master bedroom. Look what is given! The office is just off your bedroom! Framed with lots of windows and access to the large porch really add detail and function. The bedroom itself is oversized. You will appreciate having room for your king size bed and not feel the room is over crowded. The bath….THIS BATH! Enjoy evenings after a long days work soaking in the claw foot tub. The walk in shower is designed with subway tile and is just beautiful. No need to drive yourself nuts trying to keep a glass shower door clean…..This shower was designed so this is not even needed! There is plenty of counter space at both the his/her sinks. The guest bedrooms are well sized with plenty of closet space. Guest will appreciate the Jack and Jill bathroom and parents will love this concept. Everything has been so well thought in this home. There is even the most amazing central vac system! Nothing was missed. No CARPET here! From the extra insulation in the walls to the over sized fully insulated garage. You will not be disappointed! Have you dreamed of having a place for the kids to run about or maybe ride 4-wheelers? This property gives all you have dreamed of having. Its like being “Back On The Farm” but with todays function and style. The home is even wired with a 50 amp to park your camper, or maybe your friends camper, when they come to stay! You will love the nest system! The details are endless……The style is classic……Finding something like this home with all the land is difficult to locate. Anderson One schools is just the place to be. The Wren community provides lots of extra activities for the kids. Access to 85 is minutes away! You feel you are in the country but have the close proximity to it all! Bring yourself out to 150 Trotter and you will be bringing yourself HOME! Listing courtesy of Allen Tate Company - Easley. Selling Office: Non MLS.